Losing a loved one is never easy, and the sheer volume of legal documents a next-of-kin has to deal with may seem overwhelming. In these cases, a difficult but inevitable situation that arises when dealing with the passing of a loved one is: how does one go about managing the deceased’s assets? Where the deceased has left behind a Will, his or her assets must then be distributed in accordance with instructions as specified in the Will. However, who should be the one retrieving the deceased’s assets and distributing them? Of course, not everyone has the authority to take charge of the deceased’s assets. Typically, in his or her Will, the deceased would have appointed at least one Executor. An Executor is the person responsible for the distribution of the deceased’s assets to the beneficiaries, the pursuance of any debts owed to the deceased, as well as the resolution of any debts and liabilities that the deceased has. In short, an Executor is the person who will be managing the estate of the deceased according to his or her wishes as laid out in the Will. Nonetheless, even if an Executor is named, it does not mean that the Executor has the power to manage the deceased’s assets immediately upon the deceased’s death. This is because institutions such as banks, insurance companies, the Singapore Land Authority (“SLA”), the Housing Development Board (“HDB”) as well as other financial and property related entities will require the Executor to be authorised by the Court before they will permit the Executor to manage the deceased’s assets. This authorisation by the Court is known as a Grant of Probate. As mentioned, a Grant of Probate is a Court Order legally authorising the Executor to manage the deceased’s estate. With a Grant of Probate, the Executor may then approach the various institutions to request for access to the deceased’s assets. When should I apply for a Grant of Probate? A named Executor of a Will should apply for a Grant of Probate within six months from the date of the death of the deceased. When an application for a Grant of Probate is made after six months from the date of death of the deceased, the applicant will have to provide a reason for the delay. Where should I apply for a Grant of Probate? Where the deceased’s estate value is more than S$5 million the application should be filed in the Family Division of the High Court. Where the deceased’s estate value is S$5 million or less, the application should be filed in the Family Justice Courts. Although most probate applications are non-contentious, a large number of documents are required to be filed and submitted to the Court. Hence, it is preferable to seek the assistance of a lawyer to see through the application process. There are two ways to commence a legal proceeding; the first via the Writ of Summons (“WOS”) procedure, and the second via the Originating Summons (“OS”) procedure. Where an application for a Grant of Probate is uncontentious, the application may be commenced by way of an OS. This mode is cheaper and faster as compared to commencing proceedings by way of a WOS. An application for the Grant of Probate may be made by OS, via the eLitigation electronic filing system. The Family Justice Courts website provides the public with forms required for the application of a Grant of Probate here. An ex parte Originating Summons (“OS”)- This document requires details of the deceased and the applicant. Results of the probate caveats and applications search- Prior to the filing of the OS, a search must be conducted to ensure that there are no other pending probate applications or other conflicting legal interests in relation to the deceased’s estate. A certified true copy of the Will- After filing the documents required in the application including a certified true copy of the Will, the original Will should also be submitted to Court by 4.30p.m. on the next working day for verification. A certified true copy of the Death Certificate- A certified true copy of the Death Certificate has to be submitted so that the Court can verify that the owner of the estate is legally certified as deceased before authorising the distribution of assets. Schedule of Assets- This is the list of the deceased’s assets in Singapore and overseas, as well as the deceased’s outstanding debts in Singapore secured by mortgage. An estimated market value of each asset at the time of the death is also required. Administration Oath- The applicant has to give an undertaking that he or she will manage the deceased’s estate faithfully, as well as provide an account of the assets. Supporting Affidavit- The supporting affidavit ensures that there is evidence to support the applicant’s right to be authorised as the Executor of the Will. After all the documents have been filed and accepted and the Court confirms that there are no further documents required, the applicant can proceed to request for the extraction of the Grant of Probate. A final search must be conducted within one day before the date of the request to ensure that there are no existing conflicting probate applications and caveats lodged against the estate. With the Grant of Probate, the Executor may then approach the various institutions to request for access to the deceased’s assets. My loved one did not leave a Will. What should I do? Where the deceased did not leave behind a Will, one should apply for a Grant of Letters of Administration. This essentially has the same effect as a Grant of Probate and it serves to legally authorise the next-of-kin as the Administrator of the deceased’s estate. The application process is largely similar to that of an application for a Grant of Probate, except that in the application for a Grant of Letters of Administration, under certain circumstances, the applicant is required to guarantee to the Court that the estate of the deceased will be managed in accordance to the law. Such a guarantee is known as an Administration Bond and unless dispensed with, 2 sureties are also required as well. 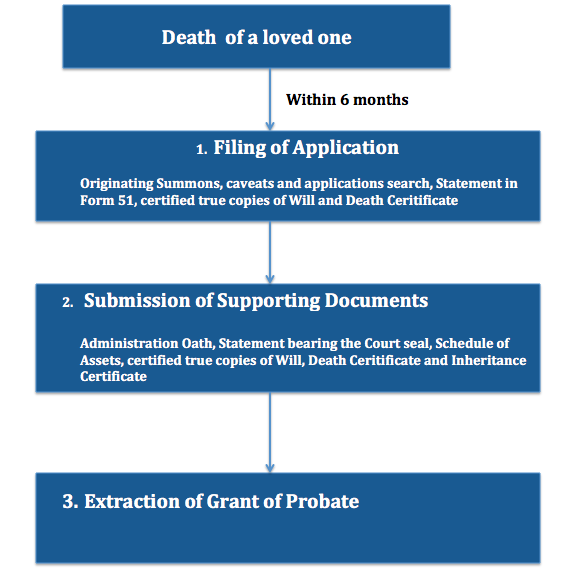 Can I still apply for a Grant of Probate if I only have a copy of the Will? If the original Will cannot be found and you only have a copy of the Will, you may be able to make an application to admit the copy of the will to proof. The Court has the power to grant probate of a copy of the Will until the original Will is found. It is advisable to seek legal advice if you encounter such a scenario as this may give rise to complex legal issues. What if I do not know what assets my loved one has left behind? If you engage a lawyer to assist you in obtaining a Grant of Probate, they are able to write on your behalf to various financial and property institutions to enquire whether the deceased was a client or held any account(s) in the institution and if so, to disclose the information required to obtain a Grant of Probate. If you have any questions about probates, you can get a Quick Consult with Felicia Ong or other lawyers. With Quick Consult, from a transparent, flat fee of $49, the lawyers will call you back on the phone within 1-2 days to answer your questions and give you legal advice. 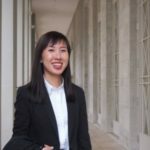 This article is written by Felicia Ong from Beacon Law Corporation and edited by Kelly Wah Kai Lin from the Asian Law Students’ Association.